The HOT ROD REUNION™ is a series of events produced by the Wally Parks NHRA Motorsports Museum, presented by the Automobile Club of Southern California, and located in Pomona, Calif.The HOT ROD REUNION events are part of the museum’s “living history” philosophy, which works to bring to life the sights, sounds and people who made history in the early days of drag racing, land speed racing and the golden age of American car culture. Unique among motorsports events, HOT ROD REUNION events honor some of the top names in hot rodding from the past and feature a fabulous array of cool drag cars, street rods and customs of the historic and present-day hot rod eras. Each HOT ROD REUNION event features a wide variety of activities, including NHRA vintage drag racing, featuring some the sport’s most famous and historic cars and drivers racing in such classes at Nostalgia Top Fuel, Funny Car, Fuel Altereds, Supercharged Gassers, Classic Super Stock, Hot Rods and others. 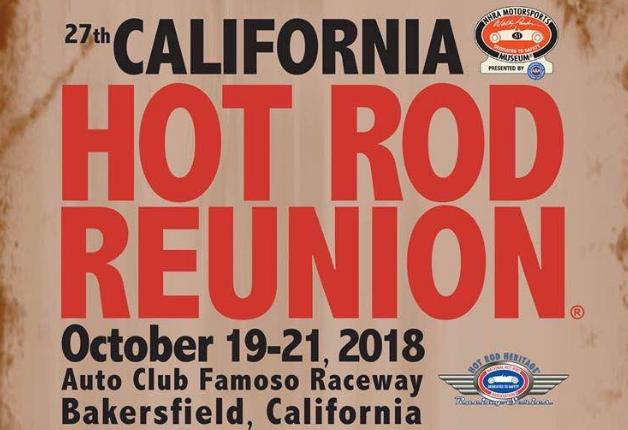 Information on HOT ROD REUNION events, including a full activities schedule for each event, entry forms and tickets, is available through the Wally Parks NHRA Motorsports Museum at http://nhramuseum.org.Requests can also be emailed to themuseum@nhra.com. Proceeds from the HOT ROD REUNION events benefit the Wally Parks NHRA Motorsports Museum. Founded in 1998 and named for the founder of the National Hot Rod Association, the Wally Parks NHRA Motorsports Museum presented by the Automobile Club of Southern California houses the very roots of hot rodding. Scores of famous vehicles spanning American motorsports history are on display, including winning cars representing 50 years of drag racing, dry lakes and salt-flat racers, oval track challengers and exhibits describing their colorful backgrounds. The California Hot Rod Reunion is the biggest, baddest, and best West Coast Heritage Series event! Super fun for the whole family! Check out our Championship Run at the 2014 California Hot Rod Reunion! 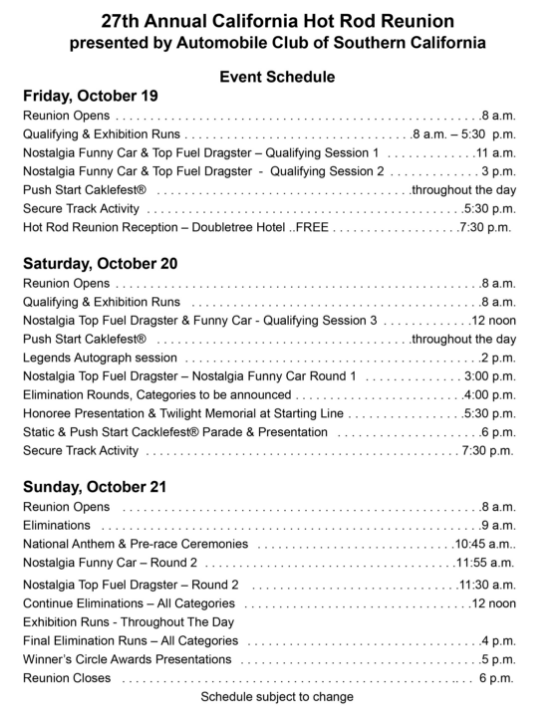 Event Schedule - Click the image to go to the Auto Club Famoso Raceway website.